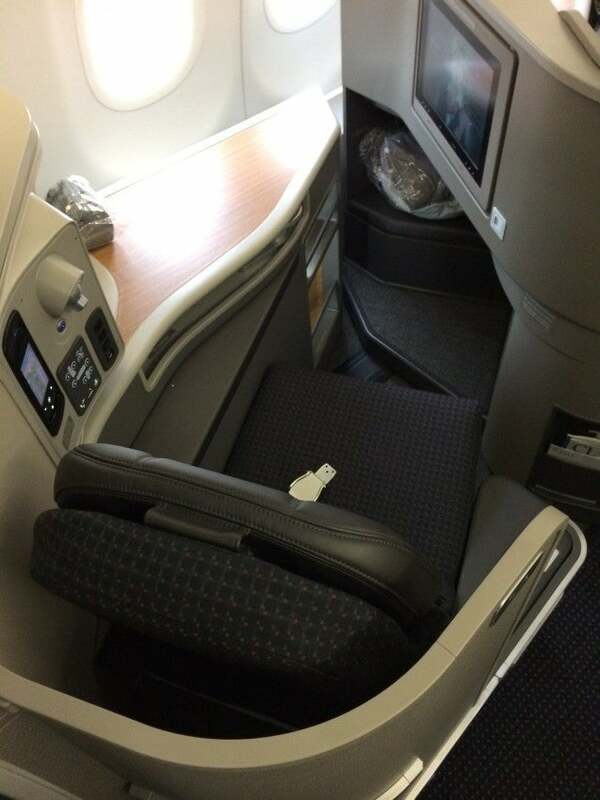 As I wrote about on Monday, I was able to book a first class award on American Airlines’ new A321 from LAX-JFK last week as part of a larger award itinerary that will eventually take me to Oman later this spring. Ordinarily, the flight would have cost me 32,500 miles one-way in first class for just the LAX-JFK leg (65,000 if no MileSAAver space is available). 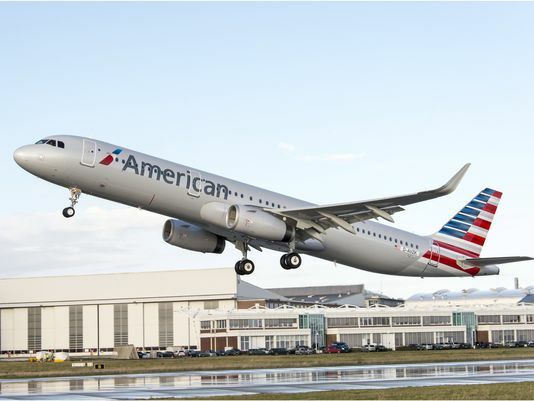 American launched A321 service on January 7. American launched the new plane on its main transcontinental route on January 7, 2014, and by the end of the month, six of the nine daily transcon flights from JFK-LAX will be operated by the new aircraft with the aim of 13 daily flights between JFK and LAX by May 8. Starting March 6, two of the four daily flights from JFK-San Francisco will be operated on the new aircraft, and by June 11, all five daily flights between the two cities in either direction will be on the new aircraft. 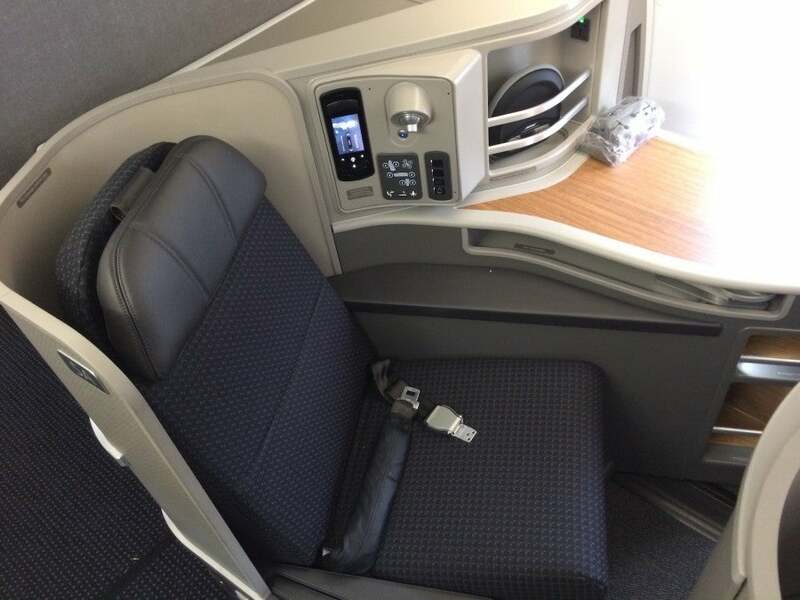 I was personally looking forward to flying in first class aboard the new plane because these 10 seats are like AA’s new international flagship business class aboard the 777-300 that I got to fly from Sao Paulo to New York last spring. They resemble the reverse herringbone seats of Cathay Pacific business class and EVA Royal Laurel business class. My transcon first class ticket entitled me to American’s Flagship Check-In at LAX. I’d experienced this at Miami, and previously at LAX, and the airline opened a new one at JFK in May. Basically you get to go to this little room off the First Class check-in counters where there are a few more counters staffed by special representatives. No one else was there while we were checking in, so it took a matter of moments and then another airline agent took us upstairs to the front of the TSA PreCheck line and even put our bags on the X-ray machine for us. 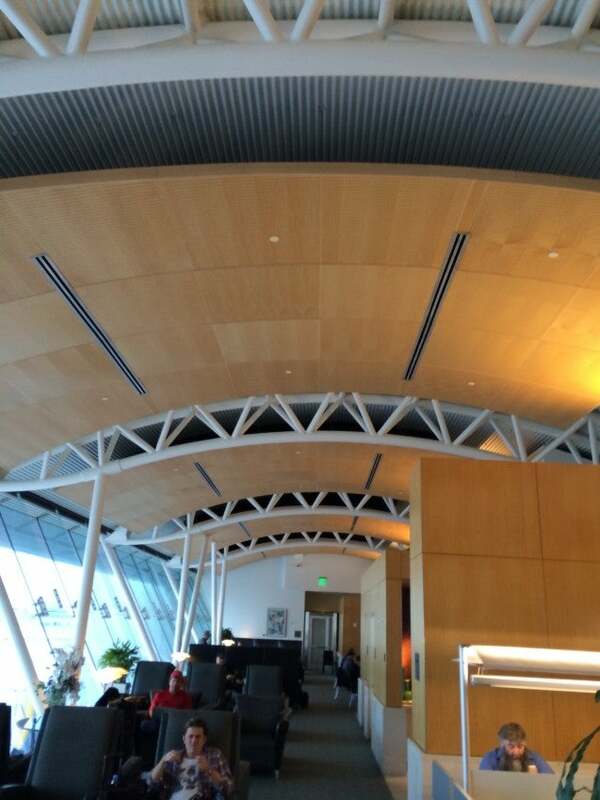 I thought it was a nice touch, and we were into the airport in minutes so we could go straight to the lounge. 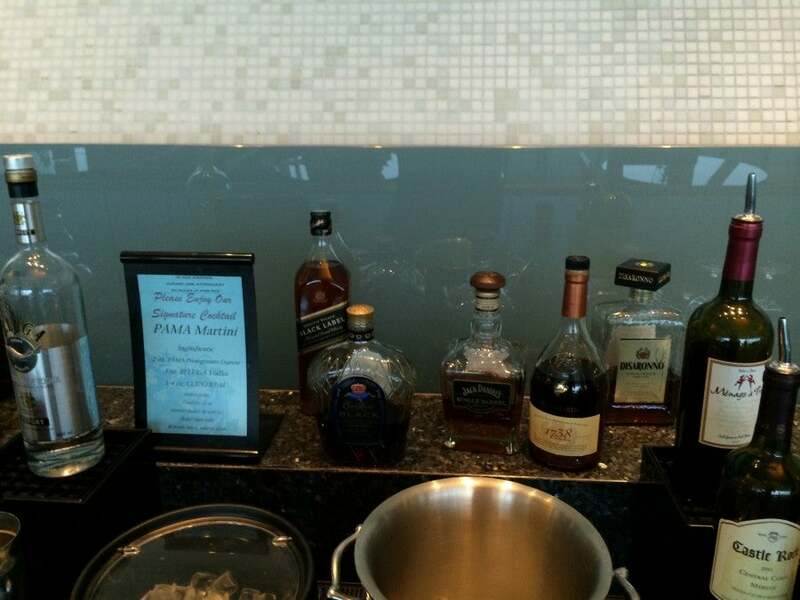 The Flagship lounge at LAX. The First Class lounge is part of the whole Admirals club on the second floor of Terminal 4 – it’s basically a smaller, separate lounge within the main lounge, and to my eyes, there wasn’t much of a difference. Cold cuts in the lounge. 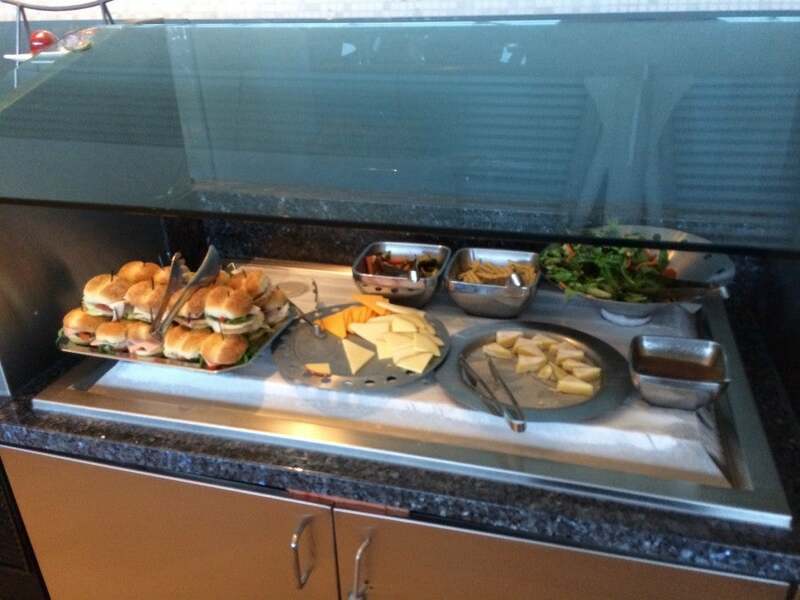 There were cold cuts sitting out and then a modest little self-serve bar, none of which was appetizing, so my friend and I waited to eat on the plane…which ended up being a mistake. But I’ll get to that below. The new A321T’s have been throwing people off it seems because AA’s transcon flyers are used to the twin-aisle 767’s, and this plane has just a single aisle, making it feel a bit more cramped on those long transcon flights. In First Class, it has 10 fully lie-flat seats in a 1 x 1 configuration in five rows. Business Class also has five rows of four seats each for a total of 20 lie-flat seats in a 2 x 2 configuration. The Main Cabin is laid out in 10 rows of a 3 x 3 configuration with 36 Main Cabin Extra seats up front. This seems to be the cabin that is bothering most people about the plane since it seems small for such a long cross-country haul- especially those who have been used to flying wide-body 767s for years. Even though the new planes have nicer amenities, I’ve still heard from numerous people (including flight attendants) that the planes feel cramped. I didn’t venture past first class on this flight since I was a little late to board, but I didn’t feel particularly cramped, though I do prefer a wide-body jet in general. Travelers in First and Business classes have access to free entertainment on 15.4-inch screens, and are given Bose noise-canceling headsets. Back in the Main Cabin, seats have 8.9-inch touchscreens with the same entertainment options, and a big plus – there are AC outlets at every seat. The entertainment systems on these aircraft also has seat-to-seat chat, live text news and weather updates, 3-D moving maps, airport maps and connecting gate information. An overhead shot of the seat. In first class, every seat is an aisle and window seat, and it looked just like my business class seat on the 777-300 from last spring. Each seat has 32 inches of pitch and reclines to over 82 inches. They are just 21 inches wide, so even though the bed is long, it still was a bit cramped for me because when the seat reclines to lie-flat, your feet go in this little cubby-shelf compartment, and I’m just too big apparently. 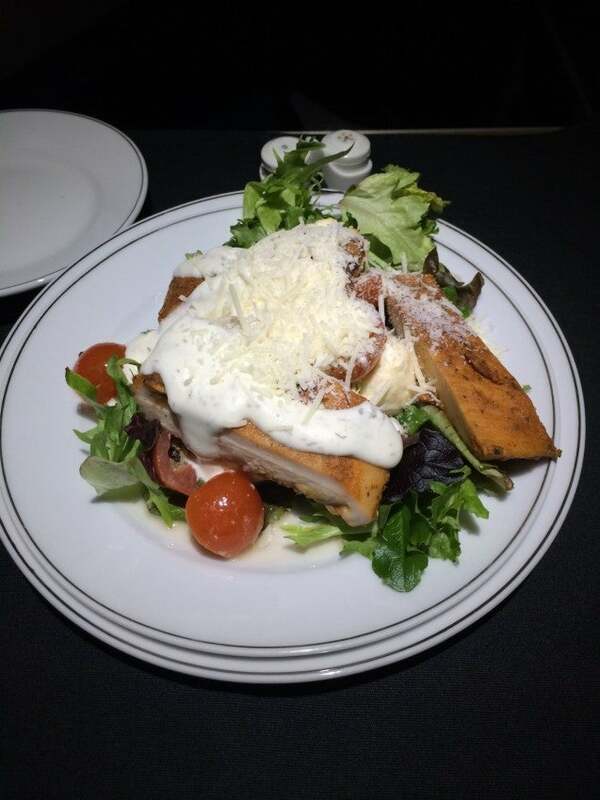 The airline is rolling out new food and beverage options on all its transcontinental routes in First and Business Class cabins aboard the A321T’s, 757 and 767-200 aircraft with a selection of new appetizers, salads, entrées, desserts, and selections for brunch, dinner and overnight travel. But as I found out, they were less than appetizing. The beef starter was not very tasty. 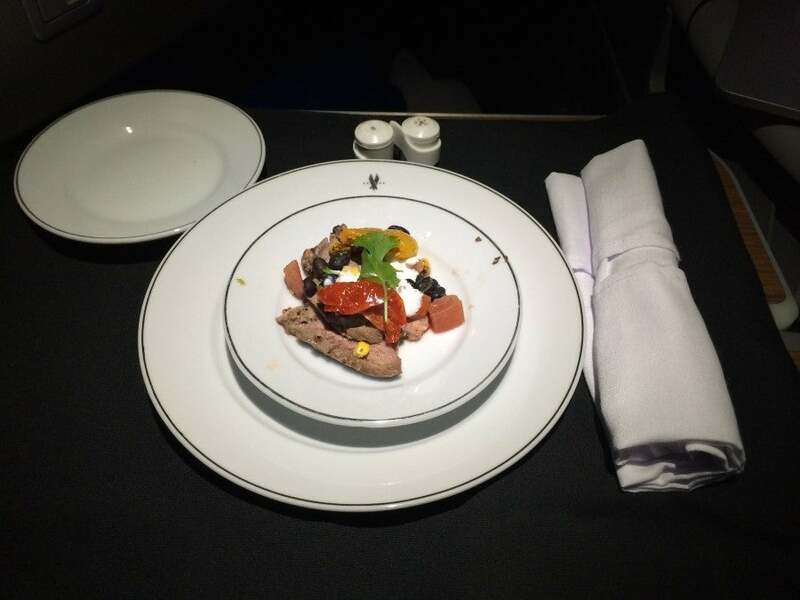 First and Business Class customers traveling domestically also now have the choice to reserve an entrée in advance of their flight – which my friend and I should have done because meal service was pretty much atrocious! It started with a choice of marinated cheese antipasto or sliced sirloin with corn salsa – the beef was decent and possibly the highlight of the meal. 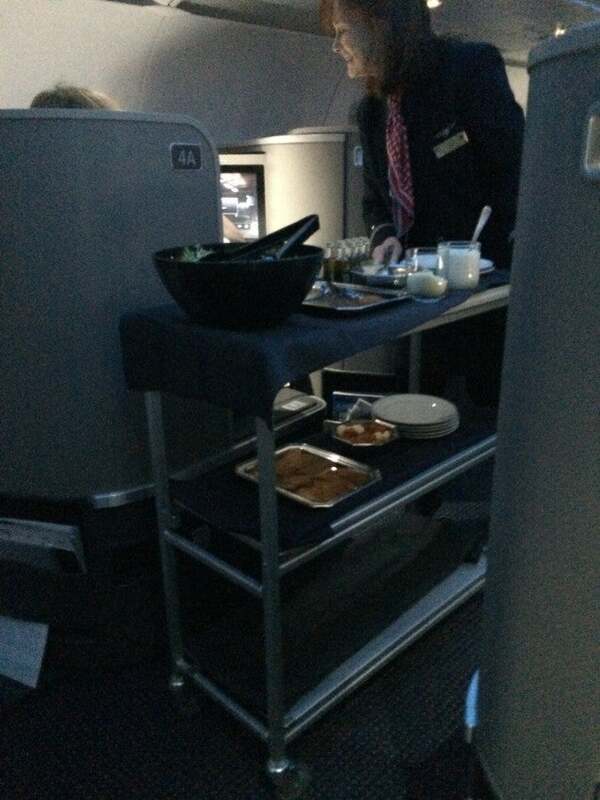 The salad was actually nice and made-to-order by a flight attendant with a cart in the aisle, though that also blocked off the aisle for quite a while – no getting up to use the restroom before your meal! – because of the single-aisle plane. My made-to-order salad, not healthy exeactly, but pretty tasty! I actually thought it turned out quite well wit seasonal greens, tomatoes, Cajun roasted chicken and herb sour cream dressing. 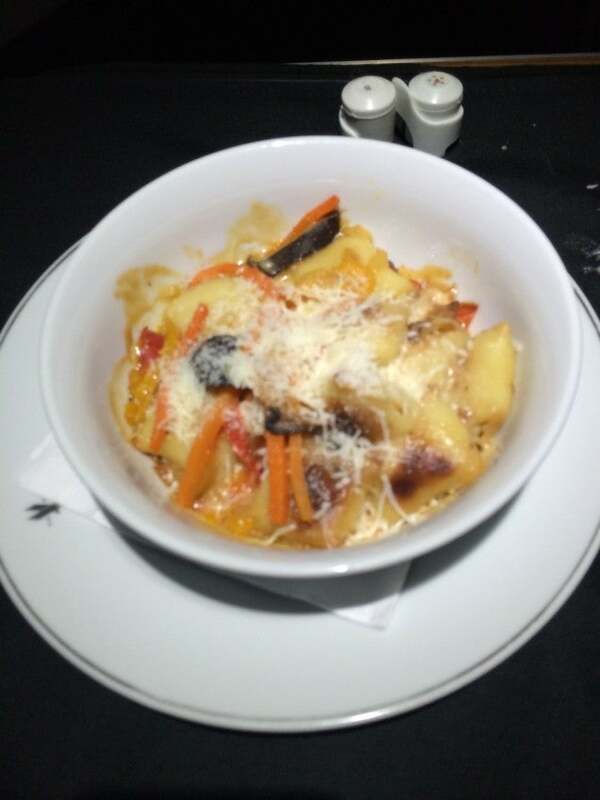 For my meal I had ordered the shrimp scami, but when it came time for entrees the flight attendant apologized that they had miscounted and they no longer had that meal for me. I had a choice of the grilled beef fillet with haricots verts or a butternut squash gnocchi. I went with the latter, which was a mistake because the pasta was sweet, but then it was covered in cheese. Not my favorite combination. No no on the gnocchi! I only ate a couple bites before giving up. Instead I ordered some wine off the all-California list, which included Sauvignon Blanc from Mendocino County and Echelon Cabernet. Having lost my appetite, I decided to sleep instead of having a made-to-order ice cream sundae for dessert, but they looked good (though it is hard to really mess up a sundae!). 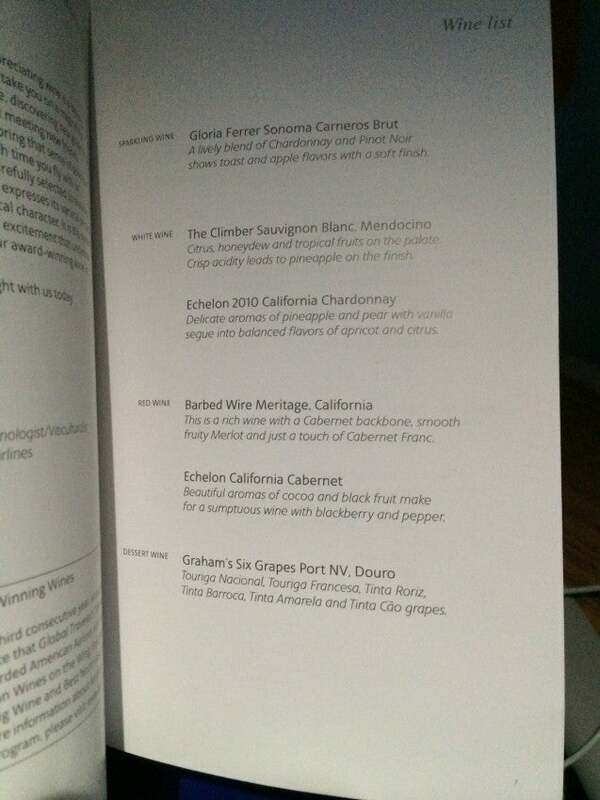 The wine list was all from California. 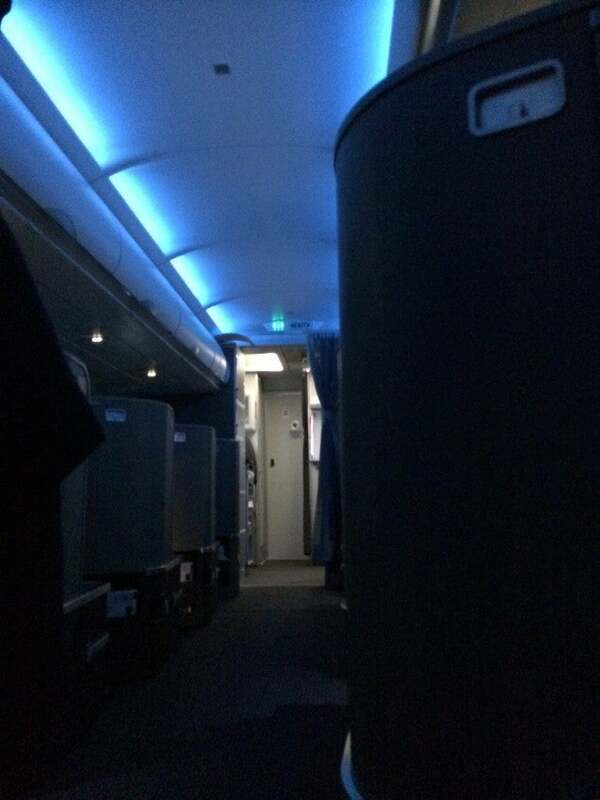 After that, it was time for a quick nap once the cabin was dimmed, and then we were landing in New York. They dimmed the cabin after meal service. The bed was comfortable enough, though a little tight for me, as I mentioned and there isn’t a whole lot of storage space for computers/electronics. The seat fully reclined into a bed. Although I was really looking forward to this flight, and I’d say it was a decent experience overall, I have to say that I’m not wowed. 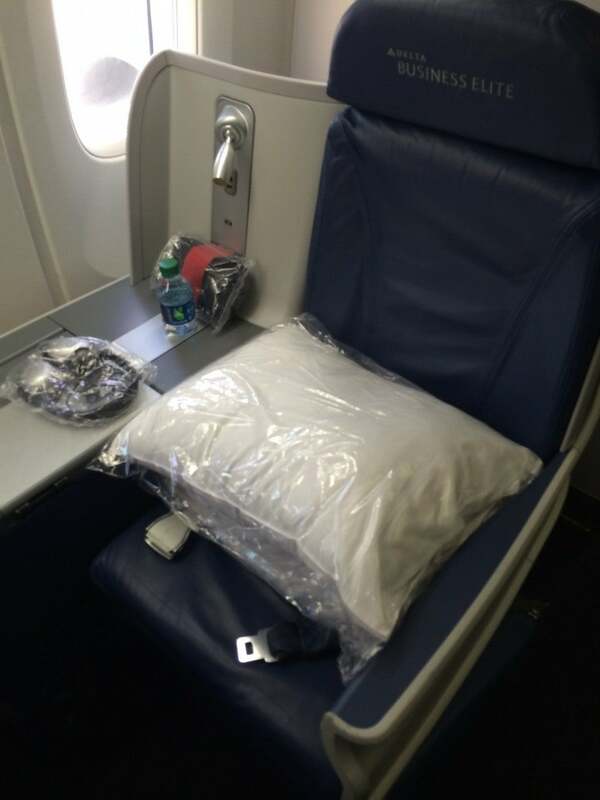 The seat feels more like a business class seat than a first class seat – probably because it is the business class seat on several airlines including American! I do like that you don’t have to sit next to anyone else, but I can’t get over the fact that American is branding this as first class when it’s pretty much equivalent to most business class products. Just a reminder if you plan to fly this route, American Airlines is offering up to 15,000 bonus miles for roundtrip travel between New York and Los Angeles from January 7-March 31, 2014 aboard the new planes. To get the bonus miles to your AAdvantage account, click here to register and use the code: TR15K. You can now book a seat for travel beginning January 7, 2014, just look for “32B” listed as the aircraft type. Read our post on this bonus to see all the terms, conditions and details. I’ve also found there to be a lot of last-minute award and upgrade availability – I even ran into some TPG readers who had been upgraded! – and after the elite ranks are thinned at the end of February and those EVIP systemwide upgrades that Executive Platinums get have expired from last year, I suspect there will be even more, which means you stand a pretty good chance of being able to book one of these seats yourself if you want to. I’ll have to fly the new Business class next time for a true comparison, but in general I enjoyed the new first class product, but wasn’t really wowed at any point. 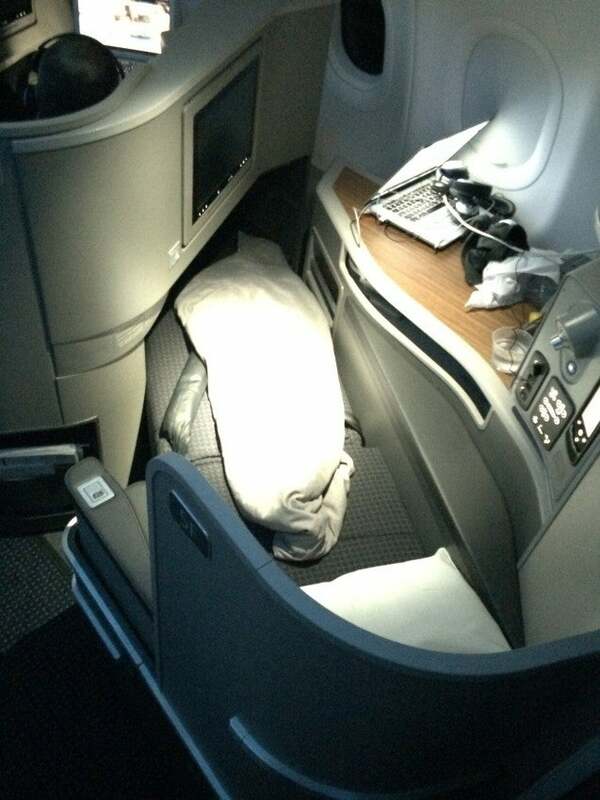 A New Age of Transcontinental Travel Begins – My First Lie-Flat Flight From JFK-LAX on United p.s.